Today I stopped by my accountant's office, picked up my 2011 tax returns, wrote out the checks, and dropped all four of them (NYC freelancers have to pay a lot of separate tax agencies) in the mailbox. I've still got to pay estimated taxes for the first quarter of 2012, but it definitely feels good to have 2011 taken care of, and most of all, it's good to be able to write those checks and know that I have the money for them in my account. In previous years, I've sometimes had to transfer money for yearly or quarterly tax payments from my emergency savings account, which never feels good. This year I finally started following some cash management advice I first heard about back in 2010, and the resulting peace of mind is incalculable. 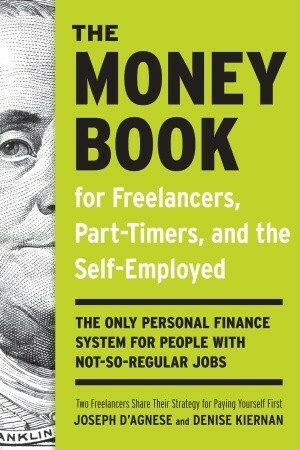 If you were reading this blog back then, you might remember my review of The Money Book for Freelancers. I can't recommend this book highly enough. When I started providing CART in 2007, I had no idea what I was doing. I'd only ever had full-time W-2 jobs before: A regular paycheck at fixed intervals for roughly the same amount each time. As long as I made sure to set up my finances so that I didn't overspend my monthly take-home pay, I was fine. When I started freelancing, everything got a whole lot more complicated. I'd invoice for a two-week stint of work and not get paid for it until a month or two months or sometimes even three months later. I stopped looking forward to winter holidays, spring break, and the summer months especially, because time I wasn't working meant time I wasn't paid for, so it felt less like a vacation and more like enforced unemployment. I always made ends meet, but sometimes it was a struggle to put anything aside, and as soon as the cash flow dried up, I'd have to dip into those savings to spackle over the gap. It was frustrating. The Money Book gave me a few simple principles to live by, which I've been gradually trying to implement since 2010. The first and easiest was to set up an "overhead account". It felt weird, but I went to my bank, opened up a second checking account, and deposited enough to cover my monthly rent and health insurance. Then I tried to forget it existed. No matter what financial crisis might come up, I at least had one month's big fixed expenses covered. The first few months after I set it up, I emptied out the overhead account right before the beginning of the month, and filled it up as checks came in over the course of the next month, but I'm happy to say I haven't had to dip into the overhead account in over a year now, and it's just been sitting there as a nice chunk of security whenever I need it. In my first post on The Money Book, I mentioned that I had been tracking all my cash purchases (personal and professional) with an app on my Blackberry and then manually importing those every few weeks into Mint. That didn't last long; the manual import process was just too tedious. I stopped tracking cash for a long time and actually only started again when Mint upgraded its Android app to allow on-the-fly cash tracking last September. I've been pretty good about it since then, though, and it's had two good effects: First, while I don't tend to carry much cash and use my debit card for most things over $20, I now know how much I spend on small purchases -- especially food, which is the most common thing I buy with cash. I've been able to incorporate my lunch money expenditures into my monthly food budget, which is helpful, and I now don't have a big mysterious lump of "Uncategorized" to deal with when I go over my spending in Mint. The second effect is also good. I've got a bit of a junk food habit (my big weakness is potato chips, especially the Honey Mustard Lays), but most bodegas have a $10 debit card minimum, so if I want to pop in for a quick bite of something unhealthy I usually have to pay in cash. But since I've been pretty good about getting in the habit of tracking any cash purchase I make, I've found myself spending less on junk food because when I weigh the crunchy deliciousness against the hassle of taking my phone out and punching through a handful of menus just to register a $2 purchase, I sometimes decide it's not worth the trouble. Beyond just junk food, it makes me generally more aware of where my cash is going and reduces unnecessary impulse buys, which is definitely a good thing. I didn't start implementing the last and most important idea from The Money Book until the beginning of this year. They strongly recommend that you split each paycheck as soon as it clears and transfer a fixed amount into taxes, savings, and emergency accounts. (Also retirement, but I'm not quite there yet, though I just turned 31, so I've got to get on it pretty soon). I liked the idea as soon as I read about it, but I tended to get my money in irregular lump sums, once every month or so, and it seemed like as soon as I had paid the bills for one month, I had only a small amount left to stretch as long as it took for the next big check to come in. I didn't want to carve anything out of that check, for fear that the remainder wouldn't last me long enough, and I'd have to dip back into the accounts I put the money into, which I knew was a dangerous precedent to set. So I just kept all the money in my business account and prayed for three years that I'd have enough in there to cover taxes, not really knowing how much of the tax money I'd already spent or whether I'd make enough in the next quarter to pay taxes for the previous one. Add in the CART drought that tends to come with the summer season, and it was pretty nerve-wracking. I got by, but my savings accounts stayed flat for far too long. Human nature being what it is, I tended to spend a bit more than I should have when the checks came in all at once, leaving me stranded during the droughts because I hadn't put anything aside during the flush times. What changed this year? Well, partly it was that I got sick of the uncertainty and decided this was the year to finally put the plan into action, but I have to admit that part of it was also striking a deal with one of the universities I work for. Rather than hiring me as a 1099 independent contractor, it put me on their books as a W-2 employee, with weekly paychecks and tax withholding. Otherwise there was no difference between my relationship with them and my relationship with the schools that pay me as a contractor; they didn't offer me benefits or expect exclusivity or anything like that. It just meant that I got less money up front, since they reserved some of what I earned for the IRS, but it also meant that I got paid weekly, regular as clockwork, and that bit of weekly security made me less anxious about the unpredictable ebb and flow of my other CART work. I started splitting each check I received -- including the paychecks that had already had their tax chunk taken out -- and putting each piece into its designated account. It was surprisingly easy to do, and I found that I had plenty of money left to live on. In fact, I didn't even really miss the difference. My emergency account plumped back up to where it had been before I took out deposit money for our apartment move last spring. My tax account filled steadily, greatly reducing my anxiety over whether I'd be able to pay the Feds this April. And best of all, my long-term hopes and dreams account finally budged from the small, sad figure it had been at for two years, giving me even more incentive to keep working and planning for the future. This W-2 deal is pretty uncommon in CART work, and I'm not relying on it; if that university runs out of students one semester and I pick up the slack at another university with a more conventional 1099 deal, I think I'll still have the self-discipline to keep splitting the checks. It seems scary at first, but it winds up making things much easier to manage in the long run. So, to sum up, my tips for a stress-free life as a freelance CART provider? * Get a good accountant. My first year, I did a walk-in at H&R Block. They were brusque and didn't really understand my business. The next two years, I did my own taxes online with TurboTax. It was fine, but I realized I was probably overpaying quite a bit, and since freelancers tend to get audited more than other people, it made me nervous not to have anyone backing me up. Last year and this year I used an accountant that specializes in self-employed and freelance workers, and it's made all the difference. I'm paying far less and I'm much less nervous that a misunderstanding or mistake will get me in big trouble. * Keep on top of your clients. If they're habitually late payers, don't let it slide; the payment window will just get wider and wider as they try to see what they can get away with. Be polite but dedicated in following up on late payments. Don't let them see your running balance with them as a source of reliable interest-free business loans. * Keep at least one month of your most important fixed expenses in an overhead account, and try to touch it as little as possible. If you have to take money out of it, prioritize filling it up before spending any money that comes in on optional expenses. It takes a while to build up a real emergency account, but you can probably set aside one month's worth if you try. The peace of mind it'll give you is inexpressible. * Get a good cash tracker, preferably on your phone so you can enter transactions at will, though a small notebook is fine too, if you don't mind transferring it to your money software by hand. Debit card purchases are great because they can be automatically categorized by most money software, but it's important not to let cash slip through the cracks. * As soon as you can, get in the habit of splitting each check when it comes in into separate accounts named Taxes, Emergency, and Savings. If you can, try to add Retirement in there too. Taxes should be between 20% and 30%, but the rest can start as small percentages and increase with time as you get more confident in the patterns of your cash flow. Keep these figures in online banks with high interest rates that don't give you a debit card, so you're not tempted to spend them on everyday purchases. Track them with your money software so you can see the numbers going up with each check; it's the motivation you'll need to keep yourself going through the lean times. Again, if you want more information on managing an irregular cash flow, I really have to recommend The Money Book. It's taught me pretty much everything I know about balancing business revenue with personal expenses, and I'm much less nervous about money since I started following its advice. There's lots of stuff in there that I haven't even mentioned, so check it out. You won't be sorry. Our best online academic help experts talk about how to select and evaluate the right academic sources, which will help you clear all your academic-related doubts. Online assignment services by My Assignment Services has been trusted by millions of students worldwide for over a decade.